Fertility, IVF, and acupuncture are a fascinating study. My patients consistently report an increase in the number of eggs when combining acupuncture and IVF. The popularity of combining acupuncture with IVF is very helpful in explaining how acupuncture patients using acupuncture alone become pregnant. I contribute my high success rate to my advanced training in classical acupuncture. As results are reported I will post them online. Each patient treated at my office is given a Traditional Chinese Medicine diagnosis and traditional acupuncture treatment dependent on the diagnosis. Acupuncture is the only treatment modality applied. I am not the only one doing research on acupuncture and fertility. 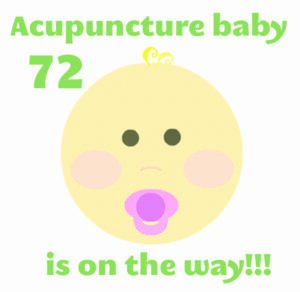 A German study showed that acupuncture Improves IVF Results and was reported in October 2004 at a meeting of the American Society for Reproductive Medicine. The research confirmed that acupuncture increases the success rate for patients receiving IVF treatment. The much talked about study, concluded that when acupuncture was added, 34 women in the acupuncture plus IVF group become pregnant compared to only 21 women receiving IVF alone. CASE STUDIES PATIENTS TREATED BETWEEN 2008-2010. History: After three IVF attempts this patient decided to include acupuncture before the fourth and final IVF attempt. The 1st IVF attempt resulted in this patient producing 5 eggs, of which 3 fertilized. The 2nd IVF attempt resulted in the patient producing 7 eggs, of which 5 fertilized. The 3rd IVF attempt resulted in the patient producing 6 eggs, of which 2 fertilized. Cause of infertility: Father had a low sperm count and low motility. Father had varicocele in both testicles and had surgery to correct this disorder. History: This couple had three unsuccessful IVF attempts before adding acupuncture prior to the fourth and final IVF attempt. The 1st IVF attempt was converted to IUI and only developed 2 eggs that were large enough to extract. The 2nd IVF attempt produced 15 eggs, 10 fertilized, and 3 embryos transferred (day 3). Patient received a positive pregnancy result, but miscarried (early). The 3rd IVF attempt produced 16 eggs, 12 eggs were retrieved of which 10 fertilized, and 2 blastocycsts were transferred (day 5). This cycle was the hardest for this patient as her ovaries were over stimulated and she needed pain medication after the transfer. The 4th and final IVF attempt produced 11 eggs, 6 fertilized over night, and 9 made it to transfer. Originally, the patient was pregnant with twins but lost 1st baby at 7 weeks. Baby Birth Date: January, 2009, a baby boy 6 lbs 11.5 oz and 19 inches long. History: Unable to conceive for 2 years. Patient already has one child three years of age, diagnosed by her OBGYN as having polycystic ovary syndrome. Baby Birth Date: The baby was born in March 2009. Cause of infertility, the father had a lower than normal sperm count due to chemotherapy. History: Patients had one failed IVF attempt. Husband had a lower than normal sperm count. Both parents diligently received frequent acupuncture treatments. History: After 3 failed IVF attempts this patient decided to add acupuncture before the 4th and final attempt at IVF. This patient was also using donor eggs for the fourth and final IVF attempt and 2 eggs were transferred during all 4 IVF procedures. Babies Birth Date: The twins expected birth date is January of 2010. History: Patient decided to combine acupuncture & IVF during first IVF attempt. The babies projected birth date is March of 2010. History: After four insemination attempts and two failed IVF attempts the couple decide to include acupuncture before the third and final IVF attempt. Baby is female and the expected birth day is August 30, 2009. Cause of Infertility: Female, Polycystic (pah-lee-SIS-tik) ovary syndrome, with low progesterone levels. History: Tried two cycles with Clomid in February and March. This female patient is now using acupuncture alone to help her conceive. Baby expected birth day is May 1, 2010. Cause of infertility: The father has a low sperm count and mother has no know issues. History: First IVF attempt was unsuccessful. Cause of infertility: Cause unknown. History: The patient was unable to conceive for 4 years and is attempting her 4th IVF cycle. The IVF attempt that included acupuncture resulted in 12 eggs being retrieved, 9 eggs matured, and two transferred. Twins Expected Birth Date: 10/16/2010. Please call to schedule your appointment or use our online scheduling system. After scheduling your appointment please print and complete the First Visit Form. Thank you for visiting Acupuncture Connecticut we serve Orange, Milford, West Haven, New Haven, Stratford, Bridgeport, Fairfield, and surrounding Connecticut areas.